His real name was Yitskhok Farberovitsh (Itzchak Baruch Farbarowicz). “Urke Nachalnik,” his name in the underworld, later became his pen name in Polish and Yiddish literature. He was born in a small town in the Lomzhe (Łomża) region in Poland. His father was an affluent flour merchant; his mother came from a well-to-do Hassidic home. He studied in religious school, and at age twelve his parents sent him to study in the Lomzhe Yeshiva. After his time in yeshiva, he gave lectures in Yiddish and Hebrew. At age fourteen, his mother passed away. A year later he robbed his own father and ran away to Vilna, and there he became an assistant to the beadle in a study hall, later a teacher of Bible, Yiddish, and Hebrew in a village near Vilna. Around 1913 he robbed his own boss and for the first time was thrown in jail. His father got him out on bail. In 1914 a family consultation assigned him to be sent away to an uncle to work in his bakery. As the work was hard and his treatment there harsh, he returned to his father and became a coachman for a wagon-driver and thus found himself in a circle of “professional” thieves and “fences,” and he sank still further into the world of crime. For a full seventeen years, he served time in various prisons. In 1927, however, in the prison in Ravitsh (Rawicz) where he was sentenced to eight years, he was overcome with a desire to write. He filled ten notebooks full of poetry, though they have been lost. “Morality controls the world”—his romantic utopia allegedly commanded. He also wrote songs. By chance Stanisław Kowalski, the Polish scholar, psychologist, and writer, became acquainted with Urke’s writings. Before making any effort to have the work published, he wrote a preface and appealed to people to turn to the president of the state and request clemency in the case of this extremely talented criminal. In 1933 his book was published in Polish: Życiorys własny przestępcy (Biography of a criminal) with an introduction by a professor from Poznań University, Stefan Blachowski (Poznań, 1933), 382 pp. The book was a sensation in the literary world, giving expression to the world of criminal activity. The author was at the time still in prison, but publishers and newspapers encouraged him to write. The Polish publishing house of Rój soon published his second book. His first was translated into Russian by L. Gdansky (Riga, 1933), 144 pp. In addition, the Yiddish press in Warsaw, Riga, New York, and Buenos Aires went ahead and published his work. Initially, they were translated from the Polish by Arn Mark and Yoysef-Shimen Goldshteyn (“the happy pessimist”), and thereafter he began to write in Yiddish. His publications include: Mayn lebnsveg (fun der yeshive un tfise—biz tsu der literatur) (My life’s course, from the yeshiva and prison to literature) (Warsaw, 1938), 256 pp. (this is the same work that was first published in Polish in 1933); Alts tsulib froyen (All on account of women), his personal life description, published serially in Haynt (Today) (Warsaw, 1933); Din toyre, shpanendiker roman fun a ganef (Judgment, the thrilling story of a thief), which was dramatized for the stage by R. Shoshana and played with great success at the Scala Theater in Warsaw and in theaters in Vilna, Lodz, and elsewhere; Der korbm (The victim), a tale; Mokotov (Mokotów [prison]), stories; and Yosele goy (Yosele the gentile), stories. These were all depictions of types from the underworld and their lives in freedom and in Polish prisons, published serially in the Polish press and in Yiddish newspapers in Poland and overseas. They also published a second volume of Mayn lebnsveg bearing the title Lebedike kvorim (Living graves); the third volume as Der letster klap (The final blow), written in 1933; and the fourth volume, Videroyflebung, oder der oysgeleyzter (Resurrection, or the redeemed one), written about 1932 or 1933. Once he was freed from prison, he married a woman from a wealthy family and settled in a home at the edge of the forest near Vilna. There his wife gave birth to a child, and he lived comfortably from his writing. Colleagues, Yiddish writers, sought him out in an effort to befriend him. When he would come to Warsaw on literary matters, he would be a guest of the Warsaw Literary Union at no. 13 Tłomackie. 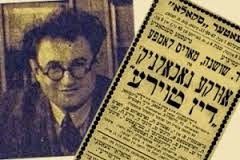 Visiting YIVO in Vilna, he became extremely interested in the lexicographic collection of sayings from the Jewish underworld, and he made some notations and corrections. Around 1936, he crossed from Vilna to Otvotsk, and when Warsaw was captured by Hitler’s armies and the terror began, he traveled to Warsaw and worked out a plan for an armed uprising against the Nazis and their Polish collaborators. He renewed his past associations with the underworld with the goal of organizing a resistance group. On his own, he collected money to buy weapons. He introduced his plan to the Warsaw Jewish community leaders (representatives of various Jewish organizations), but they were not prepared to embrace it. In March 1940, at the head of his group he staged an uprising against Polish pogromist collaborators at the Hale Mirowskie (Mirów hall). He returned bloodied into the apartment of Leyb Fayngold (Leib Feingold), a Warsaw communal leader. It just so happened that a conference concerning Jewish affairs was taking place there at the time. He demanded action from them, but they rejected his proposal. He thus returned to Otvotsk, set to carry out an act of sabotage on the train line that was carrying Jews to Treblinka. Amid the turmoil, many Jews escaped, and he helped many of them to hide out in the Otvotsk woods. During one of his acts of sabotage, he fell into the hands of the Germans. They found weapons with him. They were “certain” that such a person as “Urke Nachalnik” would not have been doing such things for the sake of ideals, and he probably had been hired by Jewish organizations. They tortured him to have him divulge who these people were. He betrayed no one. They put him in chains and led him, as the story goes, into the streets of Otvotsk to execute him, but he found the leeway necessary to throw himself on an S. S. man and seriously wound him. Right there on the spot, on Kościuszko-Allee in Otvotsk, the Nazis murdered him. Sources: Urke Nachalnik, Mayn lebnsveg (Warsaw, 1938); Nachman Mayzel, Geven amol a lebn (Once was a life) (Buenos Aires, 1951); N. Mayzil, in Yidishe kultur 2 (1946); Ber Mark, Umgekumene shrayber fun di getos in lagern (Murdered writers from the ghettos and camps) (Warsaw, 1954); Berl Kuczer, Geven amol varshe (As Warsaw once was) (Paris, 1955); Daniel Charney, A litvak in poyln (A Lithuanian Jew in Poland) (New York, 1955); Leyb Fayngold, “Ikh bin geblibn lebn” (I survived), Morgn-zhurnal (New York) (June 2 and 6, 1946).